Carl Frampton says Northern Ireland sport is in for a night at Windsor Park that will be talked about for decades to come. 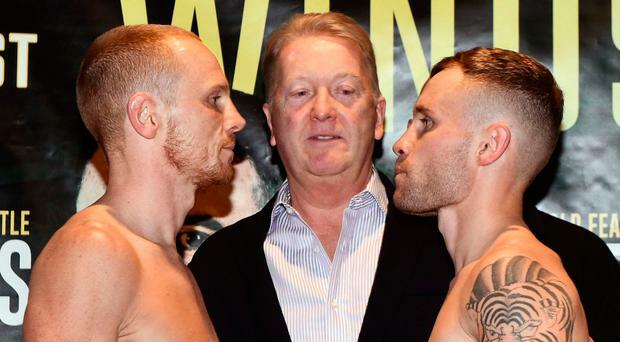 Frampton bids to overcome Australian Luke Jackson on the ultimate stage for the 31-year-old Belfast man before going on to challenge for a world title, while his close friend Paddy Barnes bids to make history by taking the quickest route ever by a Northern Ireland boxer to world title glory as he faces WBC flyweight champion Cristofer Rosales in only his sixth bout as a professional. Add in former world heavyweight champion Tyson Fury being watched at ringside by WBC titleholder Deontay Wilder, with the two on course to meet at the end of the year and it all points to quite a night at a sold-out 25,000 Windsor. "This can be a golden night for Northern Ireland sport. This is one of those occasions that everyone who is there and everyone watching on BT Sport will talk about for the rest of their lives," said Frampton. "I'm determined not to let down myself, my fans and my family, I have to win in style and I believe Paddy can win the world title in his sixth fight which would be an incredible achievement. People say this has come too early for Paddy but I genuinely believe that he is ready for this."